Bull City Mutterings: Why does the Term “Convention” Get Naming Rights in Public Meeting Facilities? Why does the Term “Convention” Get Naming Rights in Public Meeting Facilities? Could be the term convention as in convention center is a bit of a misnomer. Turns out the vast proportion of occupancy is generated by local events or consumer shows, e.g., a home or boat show. Conventions and meetings on average, generate 16% of the occupancy in the smallest category of centers like Durham’s, and potentially up to 28.9% in midsized facilities like Charlotte’s or Raleigh’s. The smaller and mid size facilities average 31.3% to 42.5% in overall occupancy so the proportion generated by conventions/meetings is better than it appears. By comparison, performing arts theaters and ballparks usually measure “occupied days” but typical occupancy is 25-45% as well. Before anyone hyperventilates, the practical maximum occupancy for a convention center is 70% overall to allow for move-in, move-out days and the efficient range is 50-60% according to PricewaterhouseCoopers, a firm that has tracked these indicators for decades. So typically the facilities are running 50-70% occupied using the efficient maximum of 60%. 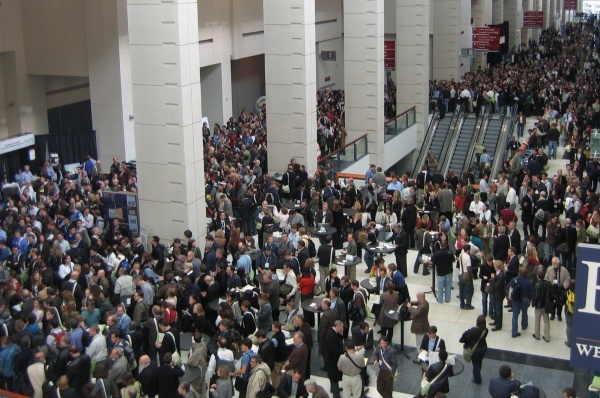 Conventions and meetings are then driving anywhere from 2 to 3 up to nearly 5 sf occupied out of every 10 efficiently available in small or mid-sized facilities. The Durham Convention Center is one third the size of the small cohort’s bracket. When incorporating the overall Civic Center complex though, it reaches the maximum size for its cohort. The drawback is that it has only a fraction of the guest rooms in close proximity. Still, using 2007, the most current stats available, the Durham Convention Center draws 18.37% of its occupancy from conventions and meetings, and 53.84% occupancy overall, both higher than its benchmark group and the occupancy is nearing the efficient occupancy potential. But occupancy inside the facility is only part of the rationale for these facilities. “Conventions and meetings” add more value to the local economy than the other convention center users. A greater proportion of attendees are from out of town on day or overnight trips so the dollars they spend on fuel, cabs, restaurants, hotel rooms, entertainment etc. outside the building have more impact on the local business climate and tax base. And that, after all, is the primary rationale behind construction of public convention centers and why the term “convention” gets top billing in the name. But it is important for any oversight to keep in mind what really keeps the lights on inside these facilities. Kudos to PricewaterhouseCoopers for laboriously tracking benchmarks like this over several decades. The truly smart communities are substituting benchmarks like these for the hyperbole and hot air often infused when making decisions on these facilities.